As the rain lashed down on the plane I smiled excitedly to myself – finally an escape from the dismal English weather. 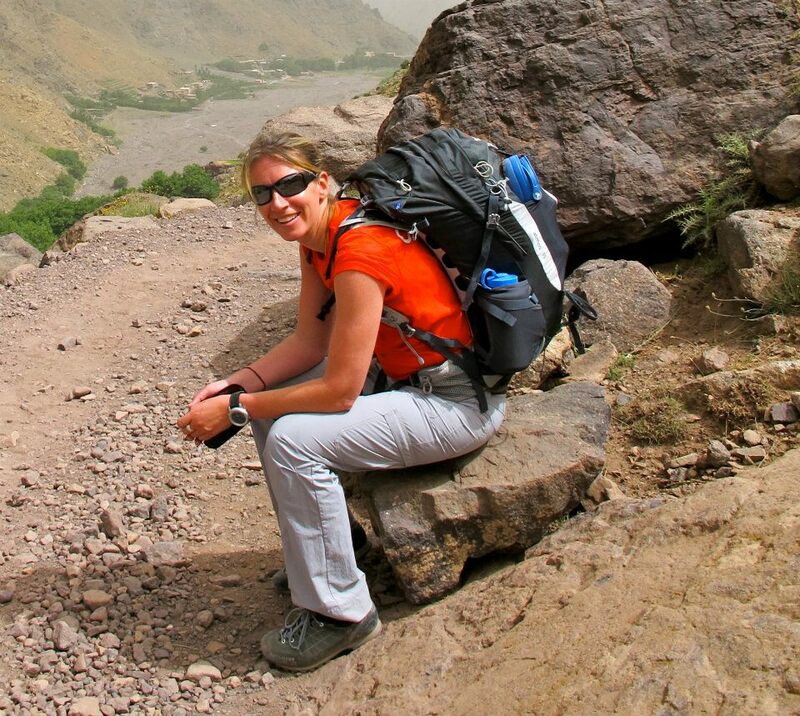 I was enroute to Marrakech to climb Mount Toubkal (4167m), the highest peak in North Africa. Toubkal is due south of the 1000-year-old pink walled city of Marrakech. Whilst it’s snow-covered throughout the winter, Toubkal is usually clear of snow by mid-summer and presents nothing more than a steep hike on a well-marked trail across scree and rock in the Atlas Mountains. 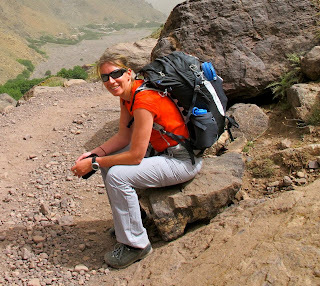 I climbed Toubkal in the summer of 2011 as a way to get fit in advance of my Trailwalker Challenge (walking 100kms over the South Downs in 24hours). What I love about this little adventure-fix is the sense of satisfaction that you get on Monday morning when you’re sitting back in the office and people ask what you did over the weekend…. apart from go to Morocco and climb a 4000m mountain..!! Perhaps it’s because both the geography is so different from ours but the weekend break genuinely feels like a week long holiday. From the colourful souks of Marrakech, with their vendors of spices, carpets and leather goods, to the pretty stone-built villages of the Berber people, I was very much looking forward to re-experiencing Morocco at its most authentic and getting in a good dose of exercise at the same time. As the pilot announced that it was a balmy 27 degrees in Marrakech I began to mentally prepare to bask in the sunshine and enjoy my cheeky escape. After breakfast, we set off on a spectacular 1.5 hour drive southwards out of the city with the peaks of the Atlas Mountains ahead of us to the start point of our trek. We stopped at the bazaar town of Asni, where I took a quick walk through the market and was absolutely overwhelmed by the plethora of vibrant colors of the wide array of fruits and vegetables being sold by the locals – apples, oranges, melons of every size, shape and color, nectarines, grapes, lemons, limes, plums… and on and on and on. Leaving Asni, we turned off of the main road and began the stunning climb into trail..! Little had changed over the course of the year since my last visit. As I began the climb up the first gradual hill as the sun beat down overhead I spent some time in quiet reflection thinking of the year gone by and the many challenges that the future holds in the months ahead – work, expeditions, family, friends…. The sun was soon replaced by some thick and rather ominous looking clouds and I reached for my umbrella. Sure enough, the heavens opened just as we reached the seasonal village and holy shrine of Sidi Chamharouch (2310m) which is surrounded by rocky peaks. A huge white-painted boulder marks the spot where, legend has it, a holy man lies entombed. Hiding from the rain in a small local hut we had a delicious lunch made up of some fresh vegetables and then set off again for a steady climb of about 3 hours to reach the Neltner Refuge (3207m) where we would spend the night. Operated by the Club Alpin Francais this hut was only completed in 2000 and has been designed to (loosely) resemble a Berber fortified dwelling. The hut sleeps around 80 people in dormitory accommodation. The refuge is a very basic mountain hut but it does have bathrooms and showers, plus a couple of large dining areas and a lounge with an open fire. By the time we reached the hut the sun was shining again. I found a comfy spot in the sun on the roof of the refuge and fell asleep only to awake to the rolling of thunder overhead. The weather was certainly tempramental today or perhaps the mountain gods were sending us a clear signal..! After a fantastic tagine dinner with lamb Mstafa gave us a thorough briefing on the history and geography of Morocco and also provided some interesting thoughts on Arab Springs, one of the key events that had taken place since my last visit. It was a great overview and certainly provided me with a greater appreciation of the history and geography of the country and its people. In true mountian form, by the time 9pm rolled around my eyes were drooping and my sleeping bag beckoned..! After a 5am breakfast, we set off on the steep-ish ascent of Toubkal. Our route zig-zagged eastwards, directly above the hut across scree and boulders, before passing between two rocky guardian peaks to reach a high corrie. The temperature was mild and I ended up layering down to my Engineered Climate Mapping berry-colored baselayer. We continued upwards across more scree, with the views becoming more expansive as we reached the ridge-line which dropped off steeply to the east. At 8.30am, we arrived at the distinctive metal and brightly spray-painted tripod which marks Toubkal’s summit. At 4167m, you can definitely notice breathlessness due to the altitude but it was a feeling that I was more than familiar with and was happy that my body quickly remembered how to adapt. No matter how many times I stand on the summit of a hill or peak or cross over a high mountain pass, I can’t help but feel a great sense of awe, satisfaction and feeling of freedom. As I tried to absorb the breathtaking views of the peaks of the High Atlas away to the north-east and of the Anti Atlas (Jebel Sirwa prominent) and the Sahara to the south I couldn’t help but feel lucky to have had the opportunity to be part of these adventures and experience the hospitality of such an old and traditional culture. Taking a steeper ‘alternative route’ down, we began our 2300m descent back to Imlil and back to Marrakech. Reaching the hotel at 6pm I must admit, I was absolutely exhausted and struggled to keep my eyes open. A lovely roof-top dinner closed the evening where we reflected on the fantastic weekend and looked forward to future adventures and travels. 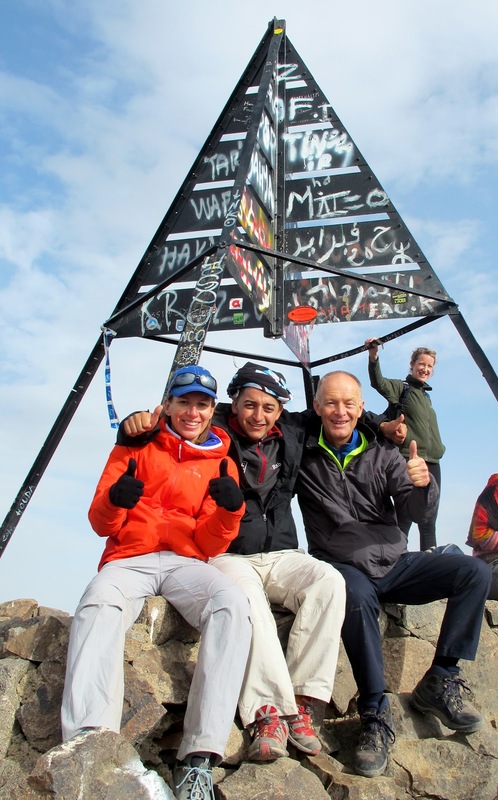 congratulation for having climbed mt toubkal in Morocco!